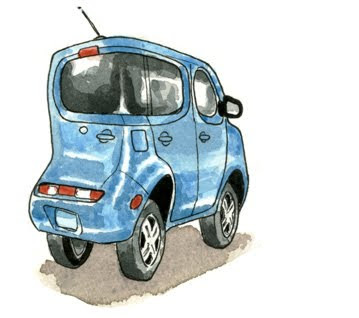 The Nissan Cube is a cool concept, but when you see it in real life, it looks just plain silly. These are just based in some random photos. I wanted to try out some watercolor over light pencil work. I haven't decided how I feel about it yet. Okay, ya got me! They are all my illegitimate children. Even the Nissan Cube. So glad you're posting more here. I'm really excited about your watercolor and it would be cool to see more of that. The CUBE style is a good direction. Thanks! I have been working with watercolor quite a bit more lately. I been trying to learn from Dan as much as I can. I got more watercolor coming in the next few days, I promise!